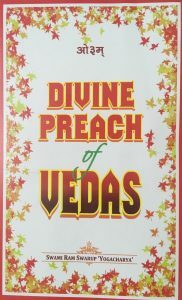 The book has various contemporary topics from Vedas. It was released on March 19, 2019 at Ved Mandir during Annual Yajyen. In the foreword, Swami Ramswarupji mentions that the book contains several matters which will be fruitful to all loving aspirants/readers. Vedas’ knowledge emanates directly from God vide Rigved mantra 10/109/1.2 and Yajurved mantra 31/. The ved mantras are the evidence/self-proof and they destroy the illusion, which is swallowing the peace at all levels. So, based on the vedic knowledge, the articles have been written and published to enable the loving readers to attain the eternal truth, which destroys the illusion. To order the book, please visit the publications section.